When I moved to USA, I didn’t have any friends, didn’t know anyone. I’m the type of person who doesn’t like to meet new people. I’m perfectly comfortable with the friends I already have, but now I had to do it, otherwise I would be all by myself here, and that’s not fun. Plus, I honestly needed some help with the baby, and my husband needed a break from me :). So he introduced me to his female colleague, and as soon as I talked to her for a couple of minutes I knew that we are going to be the best friends. I mean, we are more like family now then best friends. She and her family help me with everything. She’s always there when I need her and overall she is a great person and soooo smart and funny! 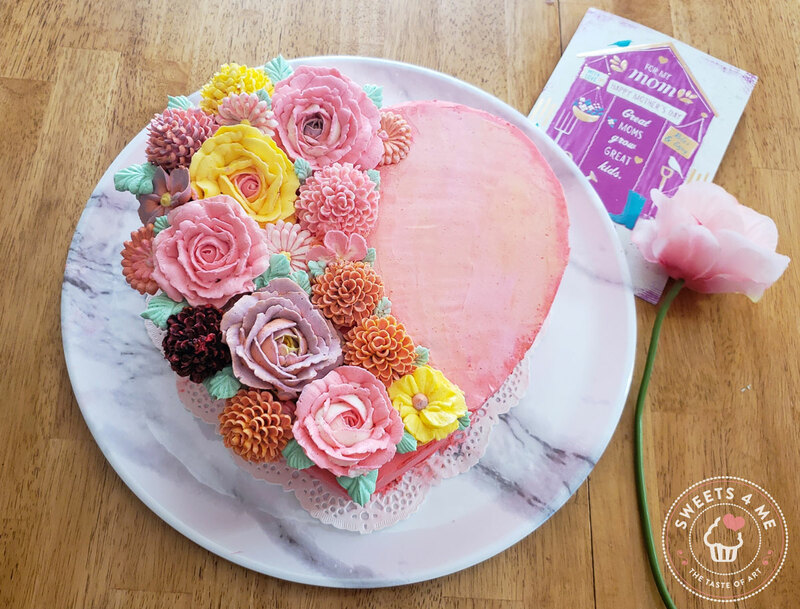 I look up to her, and her opinion is very important to me, pretty much like my mom’s is… so due to the fact my mom is unfortunately far away and Mother’s Day was coming, I couldn’t think of a better person than her to surprise with this cake. Of course, the cake needed to be in the heart shape, and I chose to make the banana cake that actually became her favorite one :). When it comes to the decoration, I wanted to avoid making buttercream flowers. I thought they were too complicated. I decided to try them out, and they turned out perfectly fine :). I was so surprised and after that my dream is to make buttercream flower cakes for the rest of my life. Honestly, it would be so nice if people would order only these types of cakes. Maybe one day :). Here goes the recipe for the perfect banana cake. Preheat the oven to 360°. Prepare tree 9 inch pans, cover them with parchment paper. Mix together egg whites, sugar, sour cream, and oil. In a separate bowl mix flour, baking powder and roasted almonds. Add the dry ingredients into the wet ones, and mix just until combined. Bake for 20 minutes. Check with the toothpick if the cake is done, if it comes out with a few moist crumbs, it’s done. Pour the apple juice over the hot cake. Let it stay for a while in the pan then move it to the cooling rack. Repeat the same procedure 3 times. In a medium pot heat 2 cups of milk. In a separate bowl combine 1/2 cup of milk, egg yolks, cornstarch, sugar, and vanilla. When the milk boils, add this mixture and cook the cream. Stir constantly until the mixture becomes firm. For about 5 minutes. Remove the pan from the stove, cover the filling with plastic wrap and let it cool completely. Beat heavy whipping cream and sugar. In the middle of mixing, melt the gelatin on the low heat and pour it into the heavy whipping cream, continue biting until firm. Combine with sour cream by hand, mix slowly.